Could you please explain what Brachycephalic Respiratory Syndrome is? Griffons are a brachycephalic breed just like Pugs, Peke’s, Boston’s, Bulldogs and Shih Tzu’s, amongst others. What they all share in common is having a shortened head so that their nasal and nasopharyngeal structures are constricted to a much smaller space relative to other breeds. Just being brachycephalic will mean that you have to at least a small degree the Brachycephalic Respiratory Syndrome. It’s the dogs that have this syndrome to a greater degree that ideally should get surgery to relieve their respiratory obstruction. Not every dog will have every anatomical problem associated with this syndrome nor have it to the same degree. Generally, this syndrome can get progressively worse due to the chronic inflammation and thickening of the affected nostrils and soft palate and the consequences of further damage to the larynx and trachea. What are the four specific problems that can occur in dogs affected with this syndrome? Generally dogs with this syndrome suffer respiratory distress that obviously is more acute when they are exercised, heat stressed and overweight. At the very least they will tend to snuffle, snort, snore and make more noise as they try to breathe through restricted nasal openings otherwise known as stenotic nares (nostrils). So as a result they will tend to breath through their mouths more readily than other dogs that is hampered if they have the second common anatomical defect of this syndrome, which is an elongated soft palate. If you study the photo below of a Griffon with a normal soft palate, you’ll see that the epiglottis looks like the bow of a ship appearing behind the tongue. The soft palate is a perfect length where it should just reach over the front aspect of the epiglottis. 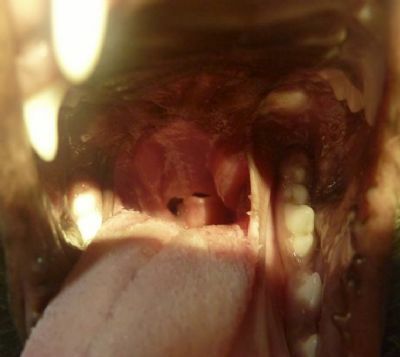 A dog with an elongated soft palate will see the soft palate extending much further back so that it will partially obstruct the flow of air into the larynx and trachea. These dogs have a loud rasping and sometimes gagging respiration. Most of us have seen Griffons have those episodes where they have trouble catching their breath taking those open mouth, deep backward snorting respirations with their head elevated. That’s an episode where the soft palate has become trapped inside the laryngeal opening. An occasional episode of soft palate entrapment could be considered normal for a brachycephalic breed but if it is happening more frequently then soft palate resection should be considered. You’ll read about the third anatomical defect associated with this syndrome where some dogs have a hypoplastic trachea. This is where their windpipe is of a smaller diameter than it should be which further exacerbates their breathing difficulties. Fortunately this is very rare in Griffons but is commonly seen in British and Australian Bulldogs (I know that Aussie Bulldogs aren’t a registered breed yet but a nurse I work with inexplicably has two of them and I’m pointing out another reason why she should have Griffons instead!). All vets know that they need a smaller endotracheal tube when anaesthetising Bulldogs than is required for similar sized dogs of other breeds. Finally there is the fourth problem, which are everted laryngeal saccules. This is where these small membrane lined pouches that are found tucked into either side of the vocal cords inside the larynx are sucked out into the laryngeal airway and so further obstruct airflow. This is always a consequence of the in-creased respiratory pressure exerted on the larynx due to having one or more of the other defects. Most mildly affected dogs can be managed by avoiding excessive exercise, espe-cially in hot and humid conditions and not allowing them to become overweight. 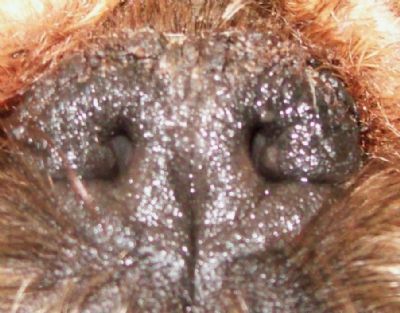 However, if your Griffon has obviously stenotic nares and/or respiratory distress with even reasonable levels of activity then you should discuss Brachycephalic Respiratory Syndrome surgery with your vet. Typically we will cut out a wedge of tissue from each obstructed nostril and suture the cut edges back together and so open up the nostrils to allow better flow of air. This is done under a general anaesthetic of course! The vet will also examine the soft palate when they insert the endotracheal tube that is required for the delivery of oxygen and gaseous anaesthetic, through the larynx into the trachea. If the soft palate is too long then the vet will resect the excess tissue and suture the mucous membrane that covers the nasopharyngeal and oropharyngeal surfaces of the soft palate over the exposed cut muscular tissue. It is a simple surgery in theory but is fiddly and best done by a vet experienced in doing this procedure. Typically we will request some weight reduction in those overweight patients before booking in for surgery and will dispense anti-inflammatory medication to start before and continue several days after surgery to minimize post-op swelling and discomfort. If the patient has everted laryngeal saccules then these are simply resected (snipped out of the larynx using a pair of scissors) during the same operation. Of course there is always some anaesthetic risk but the usual dramatic improvement in quality of life makes it well worthwhile in those dogs with marked respiratory symptoms.